Drs. McMann, Bolten, McDavid, and Lee follow the American Dental Association’s and the Pediatric Association’s recommendations for proper child dental care and believe it’s never too early to teach good dental habits. 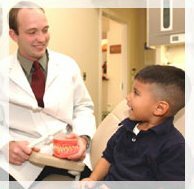 At Stonebridge Dental, every member of the staff wants your child to feel comfortable during his or her dental visit. It is important for the child to be at ease and to feel cared about during this time to allow for effective communication, smooth procedures, and to set the child up for a lifetime of good experiences at the dentist office leading to lifelong dental health! Our doctors, as well as our experienced hygienists and dental assistants, use a modern approach to dentistry that is gentle and upbeat, ensuring your child’s emotional and physical comfort. The doctors have developed techniques that are tailor-made for children to ensure their comfort and cooperation. The staff uses child-sized equipment for gentle treatment of the patient. The doctors have hand-picked a talented team that work well with children and that can understand and answer parents’ concerns. The staff can turn on cartoons for the child while he or she is in the room. After the visit the child can receive fun rewards and, of course, a toothbrush! Take your child to the dentist regularly. The American Academy of Pediatric Dentistry recommends scheduling a first dental visit when the first tooth erupts or no later than the first birthday. Regular preventative appointments are not only good for your child’s health, they help establish a consistent, positive experience for the child. Call ahead to ask any questions you might have. A calm, confident parent will help the child feel the same way at the appointment. Be on time to the appointment. Rushing to the appointment increases the child’s anxiety. Allowing enough time for the appointment lets the staff spend more time on communication. Start good habits at home. It is never too late to start good habits at home such as brushing teeth twice daily or cutting back on juice. Making taking care of teeth a priority at home will prevent problems and alert children to the importance of taking care of their teeth.